Rolling Stone magazine calls them 'the new Arcade Fire'. They call themselves Of Monsters and Men. 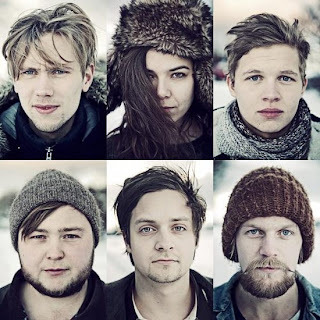 This six piece indie folk/pop group of amiable day dreamers are the winners of 2010 Músíktilraunir, an annual battle of the bands competition in their native Iceland. When Philadelphia's Radio 104,5 started playing their now hit single 'Little Talks' in 2011, it propelled the band to nationwide popularity. With success in Iceland and growing popularity in the States, the band was signed to Universal for a worldwide release of their debut album, 'My Head is an Animal'. Having it released just a few weeks ago and tours around Europe and North America ahead, I can't wait to see if Of Monsters and Men could be as successful as the Canadians they're referred to. There is a lot of potential.